An Ansa McAl salesman was Monday arraigned on four charges of embezzling a total of GYD$22 million. Thirty-two year old Apollos Manoharlall of 299 Fourth Street Alexander pleaded not guilty after the charges were read to him by Chief Magistrate, Ann Mc Lennan. He was a salesman in the construction department of Ansa Mc Al. 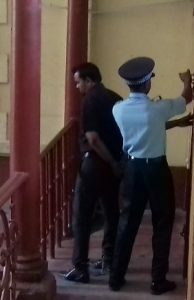 Manoharlall was granted GYD$400,000 bail on each charge- a total of GYD$1.6 million- and ordered to return to court on July 17, 2017. He is represented by Attorney-at-Law, Sase Gunraj who told the court that his client was not a flight risk and he was willing to lodge his passport. The charges stated that during March 28, 2017 to April 7, 2017 while Manoharlall was employed as a clerk or servant at Ansa McAl, he fraudulently embezzled more than GYD$22 million taken into cash by himself or in the name of his employee. When the charge was read to Manoharlall , he denied the allegations put to him.